Over the three decades preceding this one, I was lucky enough to see the Go-Betweens in a variety of different venues, ranging from a nose-to-fretboard experience in the Rough Trade shop in Ladbroke Grove to a sit-down affair with strings at the Barbican. But this Robert Forster show is a live performance first for me – he’s playing a Quaker meeting room, specifically the one in the centre of Oxford. The plain, wood-panelled hall is lit only by a chandelier which has eight of its twelve bulbs missing, but tonight it’s packed with Friends of a different kind than those to whom it usually bears witness. Wearing a dark v-neck and a white shirt, Robert Forster enters the room from stage right and studiously addresses the microphone. ‘Tonight I’m going to be speaking about anthropology.’ Then he gathers himself with a deep breath, and proceeds to play ‘Spirit’, the first number in a set of twenty songs which is never less than captivating, and comes absolutely alive as both the audience and perhaps the man himself realise that he’s still got it, sometime between the end of the first song and the start of the second. Though he modestly intimates that the audience should pipe down rather more quickly than they do, Robert nevertheless responds to the effusive warmth shown him, relaxing into a performance marked by its perhaps surprising range and diversity, given that it’s just him and an acoustic guitar. And they are performances of the songs, nuanced and emphasised in the expressive, actorly fashion that we’ve come to know and love, but which is far more apparent in the context of a one man show. Otherwise the songs are picked largely from the second phase of the Go-Betweens and the first phase of his solo career, with nothing from The evangelist (somewhat surprisingly, given the setting), perhaps because those will have been the songs that Robert has leant on when performing live over the seven years between it and Songs to play. The penultimate number is the cartoonish but touching nostalgia of ‘Surfing magazines’, and as Robert strives to do the impossible and simultaneously sing both lead vocal and the ‘da-daaa, da-daaa, da-daaa’ chorus, the audience softly, gently comes to the rescue, gaining in confidence when Robert says, ‘You could go a little louder,’ and so we do, and they’re not an untuneful bunch, his fans. In fact it sounds great, even if I do say so myself, an instance of appropriate harmony in this religious meeting room, a sending up of joyful noise to the heavens. The end of the song is greeted by rapturous applause on both sides. Robert closes with ‘Rock’n’roll friend’, and as he has intimated, subsequently reappears behind the stall selling LPs and CDs, there to greet a long line of admirers who hang around to have Songs to play signed and be snapped with the great man. I am one of these, managing to be more or less coherent when my turn to chat to him comes around. 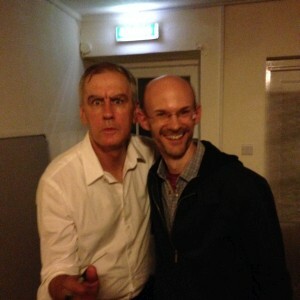 After he has signed a copy of his book, The ten rules of rock’n’roll, with a dedication to my daughter, he sets himself into a comedic pose for our photo, using those pensive eyebrows to great effect, and (seeing them out of the corner of my eye) making me laugh. I’ve met one of my rock’n’roll heroes. Oh my! Really enjoyed that, pantry boy. It has wetted my appetite, in the hope that Robert plays some shows here in the US. Well…one can live in hope. Thanks, Darren. It was a great night. Here’s hoping he makes it over to the US before long. Keith! Good to hear from you, and thanks for saying so. J’aurais bien aimé être sur la photo ! Jean-Philippe, tiens! Désolé de ne pas avoir été en contact récemment – espérons que vous êtes tous bien. Parle bientôt.